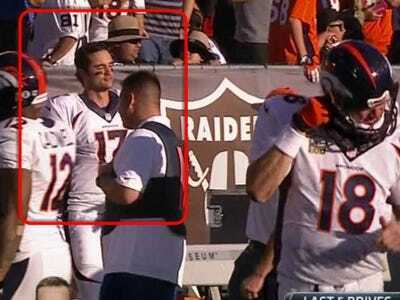 It cannot be easy being Peyton Manning’s backup quarterback. 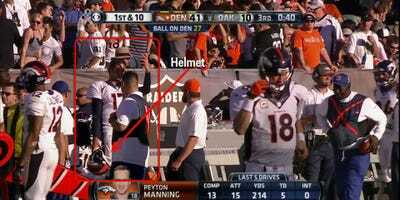 Outside of the 2011 season, Manning never gets hurt and never misses games. On top of that, Manning is such a competitor, that he never wants to come out of games no matter how out of hand the game may be. Brock Osweiler got a heavy dose of that reality on Sunday when it appeared that he was told to go into the game in the third quarter with the Broncos up 41-10. But by the time Osweiler found his helmet, Manning had apparently convinced his coaches that he wasn’t coming out of the game yet. Osweiler’s (no. 17 in the background) reaction is priceless. Osweiler did eventually get into the game, his second action of the season and just the 11th game he has played since he was drafted in the 2012 draft. That’s not a lot of time in three years for a guy drafted in the second round and the frustration seemed to boil over.